Would mirrors affect Ha imaging? - SolarChat! Would mirrors affect Ha imaging? Random one. 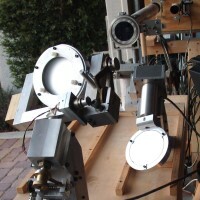 If you reflected sunlight from a pair of mirrors, silvered flats into a bench mounted Ha scope, be it a PST or a Lunt etc., would the fact you reflected the sunlight first affect the ability of said Ha scope to image? Or would it shift anything, affect contrast, or bandwidth as far as the light hitting the objective would be concerned? I ask as I'm considering an automated imaging system using a PST indoors (a shed) and using a coelostat to direct the beam. As the cost of stepper motors and linear actuators has fallen now to hobbyist levels, it makes sense. I quite often build slow motion time lapse rigs for creative photographers, so know most of the issues. I.e. easy to waterproof/frost proof a rig but not so easy on a £500-£4000 telescope. The other idea was to see if I could build a tracking mount that actually used the sun as a guide star to keep a PST etc. looking directly at the sun. I.e. not relying of sidereal/solar rate for tracking (open loop) but to actually track the sun (closed loop) with dead reckoning for when cloud covers the view temporarily. Would welcome views, ideas, "Too slow Ian, already been done" etc. Re: Would mirrors affect Ha imaging? There are lots of examples. This is one of my favorites! You have to make sure your mirrors are flat. Lamda/4 or better. Tracking could be done with a simple PIC circuit. Or by building a mechanical clock. The coelostat itself is controlled by a tracking system like you’re describing. OTOH, an equatorial mount could be outfitted the same way with an off-the-shelf star autoguider to do the same thing. ...would the fact you reflected the sunlight first affect the ability of said Ha scope to image? Or would it shift anything, affect contrast, or bandwidth as far as the light hitting the objective would be concerned? As Colin notes, maintaining flatness is of importance. When discussing the folded solar refractor and/or reflector I am considering, Joe raised an interesting point regarding the use of flats with aluminum coatings - aluminum can pass IR, which will heat the mirror substrate and cause deformation of Pyrex, etc. So the use of ULE materials is preferred. OTOH, Joe stated before ULE was used, Pyrex was coated first with silver, an excellent IR reflector, and then with aluminum, which does better in the blue and UV, and protected the silver. Of course for H alpha that is not of concern, but the deformation due to solar IR passing through the coating and deforming the substrate might be... or you could just use a protected silver coating in the first place. Mirrors have several effects on an imaging system. The wavefront error Colin mentioned is one. 1/4 wave is good, but remember that if you have more than one mirror (common in coelostats and some heliostats) then you have error stackup. The distortion caused by heating that Bob mentioned is another problem. If it was simply an issue of focus shift you could correct for it, but the mirrors are never at normal incidence, so the shift is accompanied by astigmatism, which you have to live with. Neither is a problem for me, and wouldn't be for most small aperture systems. Another problem is that mirrors are not 100% reflective. There are modern coatings that are nearly 100%, but most flats are simply aluminum. Two reflections at 90% and you lose 19% of your light. Usually not a problem, but has to be considered. Another item is scattered light. Aluminum coatings are not as smooth as you would think, on a microscopic level. The result is small angle scattering that can reduce contrast. Some coatings are better than others. Again, most people won't notice, but if you're keeping score you should consider it. Finally, mirrors at anything but normal incidence will partially polarize the reflected light. This effect varies with the incident angle and the type of coating. Yet another thing most people won't notice, but if your system includes a diffraction grating then you may notice that your system throughput varies with the orientation of your mirror collection system. Joe, what are the polarization effects of a grating? Gratings are almost twice as efficient at reflecting light polarized perpendicular to the grooves than parallel. Here's the curve for a typical 1200 G/MM 500 nm blaze grating: http://www.thorlabs.us/images/tabImages ... large2.gif This is the grating I have in my spectroheliograph now. The Newport Diffraction Grating Handbook covers in some detail the efficiences of the various gratings in S-plane and P-plane light. A fantastic reference for those interested. For a while it was hard to find online, but easily available now. Thank you Joe. That is not something I had encountered before. A quick update, had my StepperBee controller board and stepper motors arrive this morning to start work on my "toy" heliostat. Computer controlled via USB. Just need to do some soldering (I hate soldering) and write some code to drive the motors. I'm initially just going to program the two steppers to track the sun to direct the beam off one mirror to one fixed point, i.e. an open loop system based on time and calculated sky position. But I do hope to be able to go closed loop in the future by using a guide scope/PHD (or similar) to track very accurately. I then will look to go for a two mirror system to direct the beam into a PST that is bench mounted. I must add that I'm not looking to achieve anything specific here, just a low cost accurate system. Its more of a fun project for me than anything else. Sounds like a lot of fun Ian!